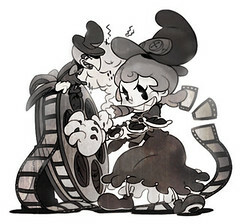 Yesterday was a big day for Skullgirls in the media! IGN had an exclusive on Peacock’s Character Trailer, and G4′s X-Play had a new preview of the game and an exclusive, brief first look at our next character, Parasoul. I was honestly hoping for them to actually talk about Parasoul alittle instead of just showing her in small snippets of footage. We gave them more than they used, but they didn’t have a lot to draw on – she’s not ready to be played on TV yet. I think this game is going to rock the world and be number 1. It’s incredible what you’re doing. I have never seen so fluid animation in a fighter and heard so many creative concepts. Really, I felt Guilty Gear had strange animations, ’cause the movements could not have much frmaes to not prejudice the gameplay, but I heard this is not an issue in this game. Awesome! But: why only girls? There’s any reason? The cast is largely determined by story stuff – Alex has created a ton of characters, but this arc of the story is focused on those characters. So the game will be all girls at launch, but there will be guy characters released as DLC in the future. I like the Peacock art on the top. I’ll love to see the rough sketch as an alternate character outfit, it’s really interesting how you keep your audience up to date. I’ll pay for that DLC and the crumpled up sheet of paper stage, that stands out.